“Rossini Goes to the Circus” would be a good subtitle for this production. While the set design is starkly traditional and the costumes are strictly early-19th century (albeit cartoonishly colorful), the staging is far from conventional. Under Dario Fo’s direction, Figaro and co. inhabit a madcap world where donkeys dance and sing, sneezes are powerful enough to knock down scenery, young girls play racquetball with samplers and balls of yarn, old men are tossed up and down in parachutes, a diagnosis of scarlet fever means being carried home in a coffin, and above all, activity never stops. Nearly every scene is populated by peasants, pretty girls and commedia dell’arte clowns who dance, carry the principles, hold up signs and banners that translate the libretto into Spanish, move the scenery a la Brecht or kabuki, and generally cavort. This production clearly influenced Emilio Sagi’s now-better-known 2003 Madrid Barbiere, but for all its own bustling surrealism, that production is conservative by comparison. The staging here is witty, with quite a few hilarious moments, but a Barbiere for traditionalists it isn’t. But whatever you think of the staging, the cast is a solid one, with especially strong performances from the three young, attractive American singers in the leading roles. David Malis is a dashing, vivacious Figaro, with a smallish yet bright, clear and handsome voice. Richard Croft’s Count is charming too, with a warm, agile tenor, though slightly bland outside of his disguises – an easy trap to fall into. Meanwhile, Jennifer Larmore, with her deep and sumptuous yet agile mezzo and lively, intelligent stage presence, is a lovely Rosina in every way. As for the antagonists, Renato Capecchi is convincing as a skinny, snarling old sourpuss of a Bartolo, though he never steals the show the way others do, while Simone Alaimo is a funny, exuberant Basilio, if younger and lighter-voiced than most. Alberto Zedda, the 20th century’s foremost authority on Rossini’s operas, conducts with all the charm and verve expected from such an expert. While he opens a few of the standard cuts, most are in place, and “Cessa di piú resistere” is omitted. 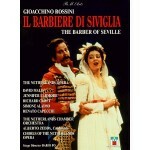 This is definitely a love-it-or-hate-it Barbiere and I’d never recommend it as an introduction to the opera. But to seasoned Rossini lovers, I recommend it wholeheartedly; first for the singers and the musicians, and secondly for the sheer creativity of Dario Fo’s madcap vision.